Actinidia chinensis (aka A. deliciosa). 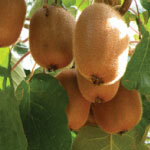 Popular exotic fruit-fuzzy brown skin, bright green flesh, strawberry-like flavor. Tender to frost. Hot or cool climates. 600 hours. Pollenized by All-purpose Male. Pollenizer for Hayward female. Does not bear fruit. Very vigorous vine. One male can pollenize up to eight Hayward females. 800 hours. Fuzzless fruit - no need to peel. Smaller than the fuzzy kiwi, often sweeter. Very high in vitamin "C". Much more winter hardy than Hayward. New growth is tender to frost, but plant recovers quickly. 300 hrs. Self-fruitful. Low chilling requirement, adapted to Southern Calif. Tasty, well-regarded fuzzy-skinned fruit. Pollenized by Tomuri Male. Pollenizer for Vincent female. Does not bear fruit. One male can pollenize up to eight Vincent females.